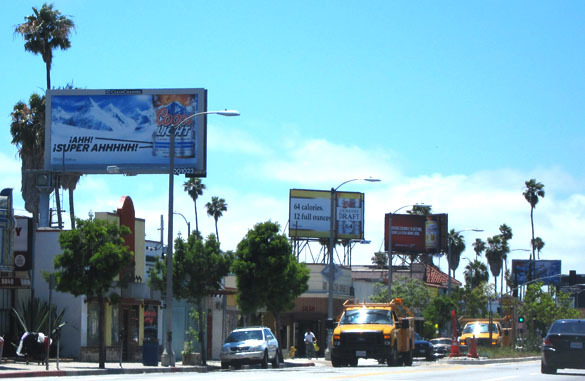 If you make your money in real estate development or outdoor advertising, there’s lots to like in the new L.A. sign ordinance set for hearing before a city council committee on Aug. 9. But if you’re concerned with blight, clutter, and advertising overload in the city’s visual environment, you may be disappointed, because the new ordinance leaves the door open for off-site advertising–including digital signs–to legally proliferate in many parts of the city, including public parks and recreation facilities. A major culprit, not surprisingly, is the provision allowing sign districts, a holdover from the 2002 ban on new off-site signs. These districts were originally sold to the public as ways that neighborhoods like Hollywood could have signage that reflected the place’s unique characteristics but deviated from the citywide sign regulations. It quickly became obvious, however, that sign districts would be a way for developers to load up their projects with revenue-generating billboards and supergraphic signs that were banned elsewhere in the city and had scant little to do with genuine neighborhood characteristics. By the end of 2008, only two sign districts had been established–in a wide area of Hollywood and in an MTA bus lot adjacent to the 10 freeway south of downtown. But those sign districts had enabled the erection of new digital billboards and other kinds of signs displaying more than 70,000 sq. ft. of advertising for liquor, fast food, cars, and other products and services. When City Planning commissioner Michael Woo called the Hollywood sign district “a fiasco” he expressed the feelings of many people who regarded this invasion of public space with both dismay and alarm, because more than a dozen other sign districts had been proposed in various areas of the city, either by property owners or city councilmembers. Woo’s comment came in commission hearings on the revised sign ordinance that significantly tightened the criteria for establishing sign districts, most importantly restricting them to high-intensity commercial areas and requiring that billboards be taken down in the surrounding community in exchange for allowing new off-site, digital and supergraphic signs. While many would have preferred that the sign district provision be eliminated altogether, at least the overall proliferation of signage in terms of square footage would be halted, and communities would enjoy a genuine, quantifiable benefit. In approving the new ordinance in March, 2009, the planning commission decided to “grandfather” only two of the proposed sign districts–one downtown and one a small extension of the Hollywood sign district–that were previously approved by the commission. The others, some with no details beyond street boundaries, would have to comply with the stricter sign district regulations in the new ordinance, including the requirement for billboard takedown. Which brings us back to our opening paragraph, and one big reason why development interests and outdoor advertisers should be happy. Applications for nine sign districts that never got as far as a public hearing before the City Planning Commission would be grandfathered by the new ordinance. Actual signage details are publicly available for only five, but those, from downtown to mid-city to the San Fernando Valley, could mean more than 150,000 sq. ft. of new off-site signage, or the equivalent of 233 full-sized billboards. The sign districts without details other than street boundaries are proposed for large developments and areas covering many acres, and those numbers could potentially double, meaning the equivalent of nearly 500 billboards added to the city’s visual environment without any mandatory takedown of existing signs. For one example, the Midtown Crossing shopping center now under construction on Pico Blvd. near LaBrea Ave has proposed a sign district that would allow 15,000 sq. ft. of billboards facing the street surrounding the projects. The area is one of the most billboard-dense in the city, but if the new ordinance is adopted by the City Council the developer can put up the equivalent of 22 new billboards, many facing residential neighborhoods, without having to acquire and remove a single one of the billboards that blight surrounding areas. –Koreatown: First proposed in 2008 by Councilman Herb Wesson for a 17-block area encompassing such major commercial streets as Wilshire and Olympic Blvds. No sign details have been made public. –L.A. Convention Center: 50,000 sq. ft. of signage on the convention center, much of it on the facade facing the 10/110 freeway interchange. –NBC Universal Evolution: Mixed use project at Universal City with 20,000 sq. ft. of supergraphic and digital signage. –Metro Universal: Project directly north of NBC Universal, with 52,000 ft. of animated signage along Lankershim Blvd. –Warner Center: Major mixed-use development between Topanga Canyon Blvd. and DeSoto Ave. north of the Ventura Freeway. Signage details not publicly available. –Boyle Heights Wyvernwood: 70 acre housing and retail development, no signage details. –Panorama Place: Retail project in Panorama City, with 18.000 sq. ft. of billboards facing residential neighborhoods. -City West: Proposed by Councilman Ed Reyes for area on north side of 110 freeway downtown. No sign details have been made public. Other sign districts have been proposed for specific plan areas, since the new ordinance no longer allows exceptions to the off-site sign ban in specific plans. Those include the area around LAX and the USC campus.